This week’s blog is for all the reptile lovers and enthusiasts out there! Did you know that one of Lawndale Veterinary Hospital’s owners, Dr. Crawford, is our resident reptile veterinarian? Dr. Crawford has always been a reptile lover at heart. As a child, he was allergic to dogs and cats so he could not keep them as pets. Since he was such an animal lover, he decided to find alternative options for pets – and that’s how he discovered his love for reptiles. So after growing up, outgrowing some allergies, and graduating from veterinary school, Dr. Crawford was naturally drawn to including reptiles in his practice as a veterinarian. 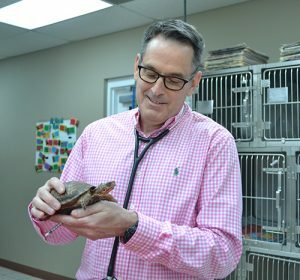 In addition to treating pet reptiles, Dr. Crawford also helps out injured wild turtles whenever he can (while he enjoys seeing all non-venomous reptiles, turtles are his favorite!). 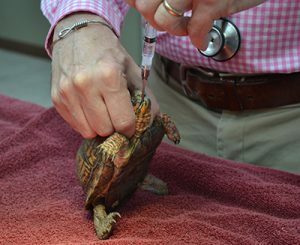 Dr. Crawford sees between 10 and 12 injured wild turtles per year that are brought in by concerned citizens. Our most recent visitor is a Snapping turtle that was injured by an automobile. 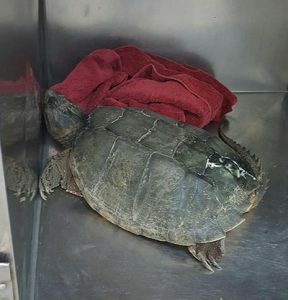 In the first week of March, this Snapper was brought to Dr. Crawford with a cracked shell and tissue damage around the neck. Since the initial surgical repairs, Dr. Crawford and our bravest staff members have been nursing this turtle back to health through topical treatments and injectable antibiotics and fluids. 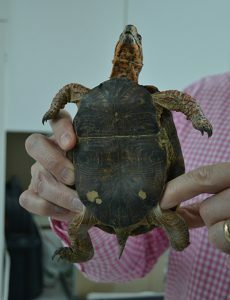 The Snapping turtle is doing great, and we have plans to release it back to where it was found next week! In addition to the Snapping turtle, we are also currently caring for Ron and Bill – two Eastern box turtles who were hit by cars in the late summer of 2015. They sustained severe feet and limb injuries, but Dr. Crawford was able to address the injuries surgically. During the recovery period, Dr. Crawford realized they would not be fully healed before the hibernation period arrived. So Dr. Crawford and our reptile-loving staff set to work getting the turtles ready to hibernate in the clinic! Ron and Bill were slowly taken off food over a 6-week period. Hibernating turtles need to have empty stomachs to prevent rotting food and gas build-up that can suffocate sleeping turtles. A hibernation space was set up that contained a moist environment of potting soil, dirt and leaves. The temperature was maintained at an appropriate level and the turtles settled in for a long winter nap. With spring approaching, we are pleased to say that Ron and Bill did great through the hibernation period. In the past week, the turtles have been waking up. The old injuries are no longer problematic. Currently, Dr. Crawford is working to get the turtles to a good plain of nutrition so they can be released back into their home environment. After rehabilitation, it is crucial to return a wild turtle to the location it was originally found. The turtle will be able to re-acclimate into it’s home range and local ecosystem. The Eastern box turtle is North Carolina’s state reptile. Turtles cannot chew their food – items are swallowed whole. If you ever come across a turtle crossing the road and decide to move it, put it on the other side of the road in the direction it was already traveling. If you put it on the side it came from, it will just try and cross the road again! Turtles can be carriers of bacteria such as Salmonella. You should always wash your hands after handling turtles (or any reptile). Many turtle species are listed as endangered, threatened or protected – and many species are illegal to own as pets. Always check laws carefully before attempting to keep a pet turtle.